For those of you who have seen my site before, things are different in appearance. Hopefully, they’re even better. As to what’s new, the paintings, when I’m finished putting them in, will actually show the right proportions. You will see them very much as they are. Also, more will be posted (eventually). Links to reprints of some of them will be included in the pages where applicable. More options are available when you check out, as well. Now for the product news. 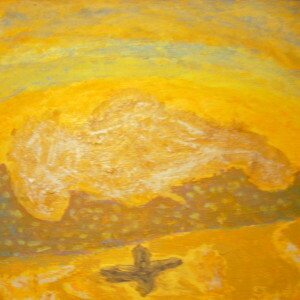 My third CD, Songs from the Spirit, will be available some time in the next few weeks through this site. Why this title? There are seventeen songs in the album, and more than half begin with a song in tongues (a heavenly language), which is then interpreted in the second half of the song. As we see in Eph 5:19, we are told, “Speaking to yourselves in psalms and hymns and spiritual songs, singing and making melody in your heart to the Lord.” I have considered this verse to be my guideline in my singing. My first two CD’s, also available through this site, arrange hymns uniquely (flute and vocal) and set Bible verses to music in a unique way (soothing, relaxing, all sung. Also, music was my earliest means of expressing myself in praise to God. Referring to my newest CD, it is more than that. It’s an expression of God’s love for us and our response to His love. To get a feel for it, it must be heard. I am adding many of my paintings to this site, more than I have in the past, because I now can post these in the correct way, showing the painting as it really is. In terms of artistic, creative expression, other than learning knitting and crocheting early in life, it became the next step in my creative growth, while not letting go of the music. Most of my paintings are small, not miniatures, but under ten inches in length, even less in width. The selection of style of painting seems to be based on subject. When a human or angelic figure is expressed, the features are often the result of a single bristle on a brush, as are some of the words referred to in descriptions. Several artists have been referred to in describing some of my paintings. As I am a “self-taught” artist, I am not consciously following any particular style. I do have a few larger paintings available, but have not as yet taken pictures of many. My jewelry, for which this site is named, continues to grow in products available. Each picture shown represents one only product. However, in the area of memory wire bracelets, colors and color combinations are growing, and I am not able to keep up with the images necessary for these. If you do not see colors you would like to see in that type of bracelet, give me time to upload them. A pair of earrings shown in a set on this site has been sold, and when that image is posted, I am making note of it, as well as showing which are available. I continue to have necklaces in various sizes, colors, and styles, including memory wire. In rings, I am staying with variations on beaded rings for the most part. A very few rings have been shown on this site. In memory wire rings, the size is size eight. In pottery, once the few pieces are sold, that’s it. I may decide on some jewelry related clay, but that would not be the type of clay that’s used in the pieces shown. Now, for my latest effort. I have finished my novel, Jaden’s First Thirty Days in Heaven. Jaden is a 9-year-old boy when he dies in a bicycle accident. The novel describes thirty days of an orientation school, heaven style. Because time in heaven, based on scripture, can be felt in different ways from what we experience here, the actual time would not be known. Throughout the book I am using his perceived time as the reference point. Many have expressed an interest in it, and I will post details when it is available. This is one of the images being considered for the cover of the novel. A portion of it would be used.